When you're searching for a compact SUV that will keep you comfortable as you drive around town, don't look any further than the new Ford Escape. At North Central Ford, we can show you the different trim models that are available to suit your needs. The Ford Escape comes with SiriusXM Satellite Radio so that you can listen to the music you want. To help you get around, it is also equipped with SiriusXM Traffic and Travel Link. Navigation will be a breeze with the dashboard screen the verbal directions of how to get to your destination. 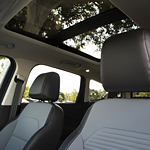 To allow everyone in the vehicle to have amazing views, the Ford Escape comes with a panoramic Vista Roof. The forward panel can open fully or just tilt up to increase air flow into the cabin of the car. There will be plenty of light available.